After the last debate, Mitt's son Tagg claimed that he wanted to take a swing at Obama for calling his dad a liar. Um, isn't that treason to wish harm on a sitting president? In this bizarre news segment, Lawrence O'Donnell lays out some fascinating points. That Mitt never served in Vietnam because he was in France on a mormon mission, that none of his sons have served because they were on mormon missions. These "missions" consist of attempting convert others to their faith. The conclusion is that the Romney men would prefer to serve their god, who lives in outer space near the planet Kolob, than their country. Yet the Romney boys support every war ever proposed and Mitt's platform includes getting tough (ie starting a war) with Iran. This touches an anti-elitist nerve because most senators have sons who do not serve in the military, yet often vote for war. Lawrence details the Romney family history, and why he was born in Mexico: his grandfather was escaping persecution for having multiple wives. That's part of the mormon faith they don't like to discuss much. Polygamy is frightening to many Americans, so I hope this video is shared widely--it contains little known facts which have the power to harm the Romney campaign--and a special thanks to Whoopi Goldberg for opening this sticky subject on The View yesterday. Sadly, O'Donnell ends this informative segment by challenging Tagg to take a swing at him instead. In this age of trainwreck reality hits it may make for riveting TV, but it's hardly suitable behavior for a newscaster. But that doesn't tarnish Lawrence's great reporting of little known facts on the Romney family earlier in this broadcast. 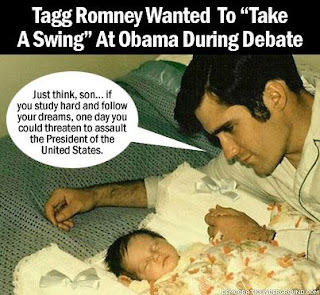 If all the Romney men going back to great grandfather never serve in the military because they are too busy selling their odd cult religion, who will Mitt Romney serve should he get into the White House?